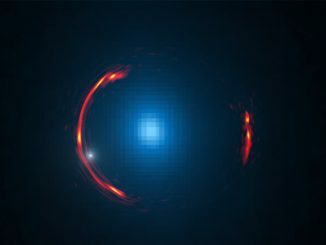 Artist’s rendering of ULAS J1120+0641, a very distant quasar powered by a black hole with a mass two billion times that of the Sun. Natural gravitational ‘microlenses’ can provide a way to probe these objects, and now a team of astronomers have seen hints of quasar brightness changes that hint at their presence. Image credit: ESO/M. Kornmesser. Some galaxies pump out vast amounts of energy from a very small volume of space, typically not much bigger than our own solar system. The cores of these galaxies, so-called active galactic nuclei or AGNs, are often hundreds of millions or even billions of light-years away, so are difficult to study in any detail. Natural gravitational ‘microlenses’ can provide a way to probe these objects, and now a team of astronomers have seen hints of the extreme AGN brightness changes that hint at their presence. Leading the microlensing work, PhD student Alastair Bruce of the University of Edinburgh presents their work today (1 July) at the National Astronomy Meeting in Nottingham. 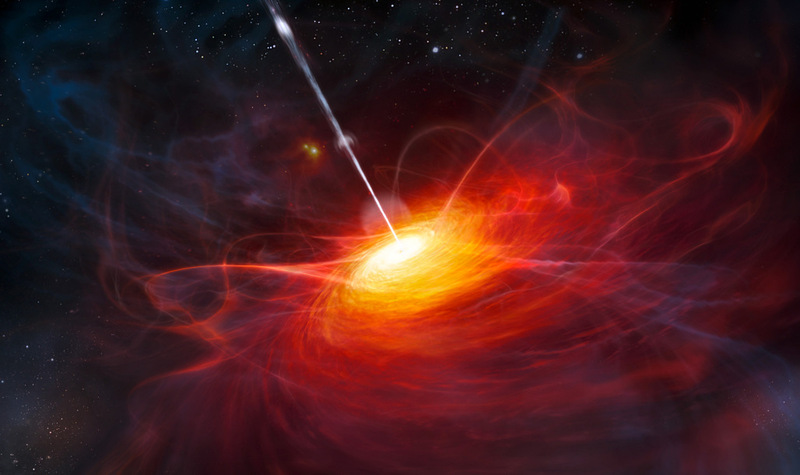 The energy output of an AGN (quasars being the most energetic and distant forms of active galactic nuclei) is often equivalent to that of a whole galaxy of stars. This is an output so intense that most astronomers believe only gas falling in towards a supermassive black hole — an object with many millions of times the mass of the Sun — can generate it. As the gas spirals towards the black hole it speeds up and forms a disc, which heats up and releases energy before the gas meets its demise. 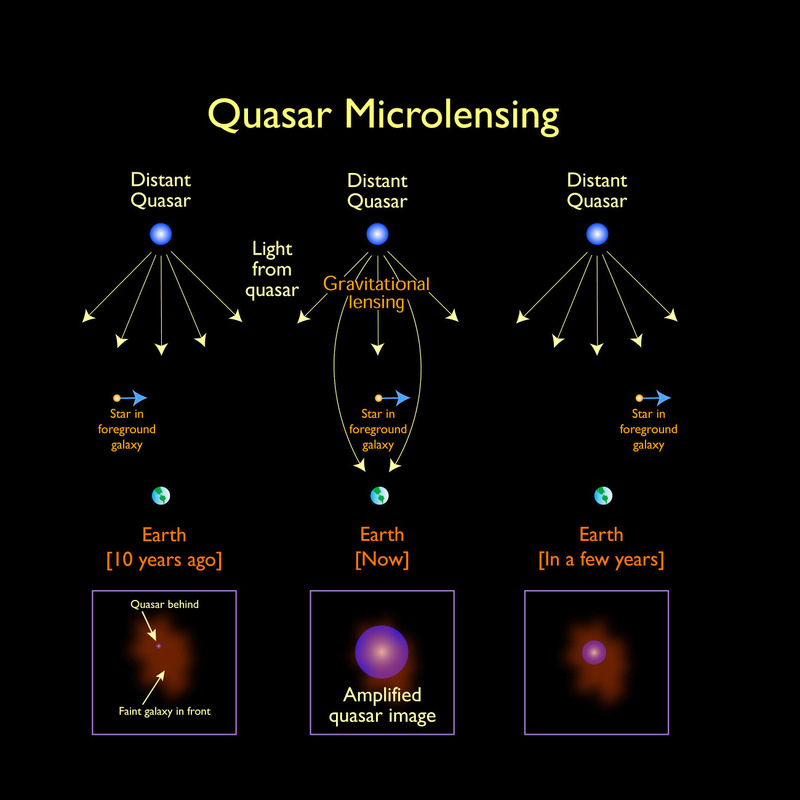 A schematic diagram showing how microlensing affects our view of quasars, the most luminous active galactic nuclei (AGNs). Click graphic for a full-size version. 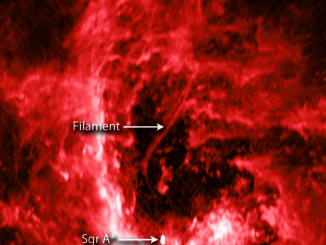 Image credit: Alastair Bruce / University of Edinburgh. This means that if a planet or star in an intervening galaxy passes directly between the Earth and a more distant AGN, over a few years or so they act as a lens, focusing and intensifying the signal coming from near the black hole. This type of lensing, due to a single star, is termed microlensing. As the lensing object travels across the AGN, emitting regions are amplified to an extent that depends on their size, providing astronomers with valuable clues. 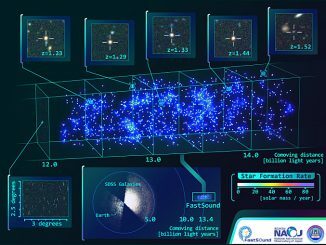 Using data from the 8.2-metre Subaru Telescope, an international team led by Japanese researchers has made a 3-D map of 3,000 galaxies 13 billion light-years from Earth. Based on this comprehensive survey — the first such study at this great distance — the team was able to confirm that Einstein’s general theory of relativity is still valid.